SALT LAKE CITY, UTAH (July 16, 2014)- The first big mountain freeride competition of the 2014-15 Freeride Series will kick off August 20-25 with The North Face Chilean Freeskiing Championships in El Colorado, Chile. The event is open to male and female skiers only. Stop number one of the Freeride Series will take place on the massive cliff-riddled Santa Teresa venue. The series is North and South America's premier level big mountain freeride tour providing five competition stops for skiers and four events for snowboarders. All events will be webcast live on SubaruFreerideSeries.com. For the sixth consecutive year, big mountain ski competition will return to the Southern Hemisphere, allowing athletes from around the world to earn points on the 2014-15 Freeride Series. The top three results out of five events throughout the competition season will crown the overall Freeride Series ski winners for men and women. The remaining four Freeride Series events in North America will be announced at a later date. "It is great to see this stop take place in Chile once again," explained Peter Leatherbe, El Colorado general manager. "It is a pleasure to open this out-of-bounds area of Santa Teresita. The special security measures applied by the event organizers combined with the serious preparation of the world's best skiers make it possible to compete on this special venue safely." Registration for the The North Face Chilean Freeskiing Championships will go live on SubaruFreerideSeries.com on Tuesday, July 22 at 10 a.m. MST. "It’s very fitting to kick off the 2014-15 Freeride Series in the world class terrain of El Colorado, which always promises to challenge the best of riders," said Freeride Series Event Director Bryan Barlow. "Freeride's growth in Chile is very apparent, and I can't wait to see the local Chilean riders rise up to compete against some of the world's best freeriders." In addition to podium awards, one skier at each event will be selected as the recipients of the Backcountry.com Sickbird award. This award is highly coveted by the big mountain freeride community and is granted to riders who challenge not only themselves but also the sport through their athletic performance. For athlete information contact Julia Jimmerson, MSI athlete relations manager, at jjimmerson@mtsports.com or (801) 349-4616. A new website will be launched soon. For media or general information contact Max Kuszaj, Freeride Series Chile media relations, at 801.244.7780 or skierinblack@gmail.com. 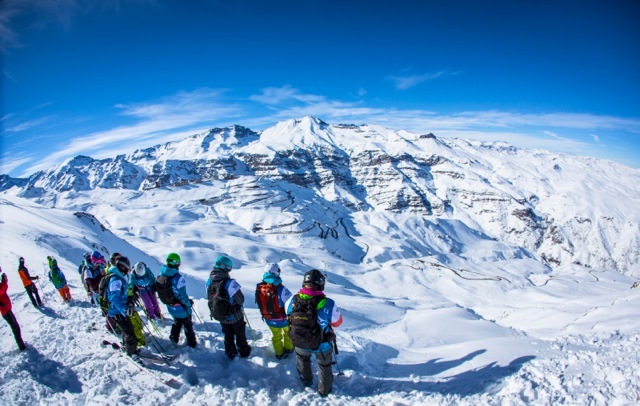 The Freeride Series is North and South America's premier big mountain competition events providing five stops annually for skiers and snowboarders. A Mountain Sports International production, the Freeride Series' roots date back to 1997 with the creation of the Freesking World Tour and The North Face Masters of Snowboarding in 2008. In 2013, big mountain ski and snowboard competitions united under the title Freeride Series to connect the freeride community and further progress big mountain freeriding as a sport. For more information visit subarufreerideseries.com. Mountain Sports International (MSI) is a private company, founded in 1997, to develop and produce action/adventure sports events and programming in North America. MSI operates the Swatch Freeride World Tour by The North Face, in addition to several other properties and concepts. MSI launched MSI Live in 2009, to provide live HD webcast production, content management, encoding, and satellite uplink & delivery. MSI provides event management services, infrastructure and expertise for high-end brands, including The North Face, Red Bull, Subaru, UFC, Burton and Sierra Nevada. MSI matches brand and culture, company and credibility, to create sought-after events that help to define the action sports culture. For more information, visit mtsports.com.